The bathrooms of the Urselia Díaz Báez de Alamar primary school in Havana del Este are another example of the deterioration of educational infrastructures in Cuba. From the Island a netizen sends to CiberCuba this video recorded last March 12, in which you can see not only hygiene problems and missing tiles on the walls but the conditions in which the cup of a primary school is located, which Hard penalties survive the precariousness of investments in the Cuban teaching system. According to the person who sent the video to CiberCuba and who prefers to remain anonymous, this elementary school does not only need to reform the bathrooms. He also has problems with the furniture of the classrooms that are "in a state of gravity". "The conditions are terrible, the tables are broken and what you can imagine is little," adds the complainant. It is not the first time that similar images arrive from Cuba. 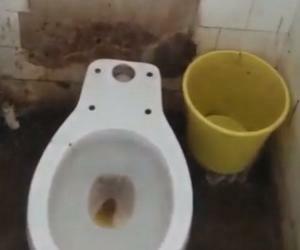 In September 2018, a Cuban mother also denounced the condition of the bathrooms at the Fernando Cuesta Piloto primary school, where her son was studying in Santa Clara. The situation was more or less the same at the Ignacio Agramonte primary school in Pogolotti, in Marianao, practically in ruins. This school year 2018-19 began in Matanzas, marked by a notable crisis in the infrastructure of educational centers, a growing deficit of teachers and the threat of an epidemiological outbreak. Children's circles such as the Manuel Ascunce, from the municipality of Perico, did not start the school period due to their poor construction conditions. Something similar happened with the basic elementary generation of the Centennial and the primaries Mariana Grajales, Abraham Lincoln, Julio Rufín and Leonel Fraguela, all with delays in their respective maintenance tasks. We already saw in CiberCuba the level of abandonment in which there are elite centers such as the Marcelo Salado National Swimming School, the Lenin Vocational Pre-University Institute or the University of Computer Science. Images like these demonstrate the effects of 60 years of Cuban socialism. Education, one of the achievements with which the communists of the Island have been breastfed for years, is waters.